Uniforce Sales and Engineering specializes in image acquisition, image processing, video recording hardware and software, components, and systems. Our mission is to provide a well-integrated, cost-effective, state of the art imaging solution for each client. We provide the newest imaging components available, as well as fully integrated systems and subsystems. For over 30 years, Uniforce has provided cost effective, highly reliable imaging systems and solutions to military, semiconductor, medical, biotech, aerospace, manufacturing, scientific, and broadcasting industries amongst others. Uniforce is your Single Source for Imaging Solutions. A PC-based machine vision system has been used to continuously monitor changes in biomass concentration and to control the undesirable production of colloi-dal elemental sulfur (a reactor upset condition due to an excessive concentration of inhibitory sulfide substrate) in a bioreactor containing Thiobacillus denitrificans. A field of view of a video camera was established which contained regions of different background lighting. Mean values of the distribution of red, green, and blue intensity components within corresponding regions of a digital image captured from the camera were used to monitor color changes associated with changes in biomass concentration, and to determine if the reactor was in an upset condition. A machine-vision-based approach is adopted to utilize its advantages of measurement flexibility, high resolution, and non-destruction. With a closed-loop feed-back control architecture, the inspection procedures are fully integrated with the production process to detect and to recover abnormal operations in a real-time mode. Implementation of such a system at a physical shop floor for socket inspection is presented as an example. Uniforce serves a wide variety of medical applications in diagnosis, treatment, and research. Makers of hospital supplies and medical technology products know that quality inspection is critical to success. Liability for defective product, inconsistent quality, rapidly changing costs, increased global competition and pending Unique Device Identification (UDI) regulations all challenge the profitability of medical device manufacturers. Manufacturing requirements for measurement range from presence verification to checking high-precision dimensional accuracy and geometrical tolerances. At-tention to the inspection environment and image quality is as important as the vision algorithms themselves. Uniforce sub-pixel measurement tools, combined with the right optics and stable lighting, provide the precision and repeatability to ensure manufacturing accuracy. Uniforce is uniquely positioned to provide state-of-art imaging components and sub-systems to the Defense and Security Industry. Our commitments to innovation and performance have led us to build an extensive technology portfolio in visible imaging, from advanced image sensors through our innovative "smart camera" platforms. We also offer a broad range of UV andX-Ray imaging solutions. With Canada's only world class MEMS foundry and technology partners, we have a unique capability and access to uncooled short-, mid-, and long-wavelength infrared detector technology based on a variety of technological concepts. In semiconductor manufacturing, yield drives costs, so manufacturers inspect products at many points between bare wafers and packaged ICs, seeking to identify defects as soon as possible. As lithography geometries shrink, inspection systems need to be able to resolve defects on progressively deeper sub-micron scales (eg. 45 nm, 32 nm, 22 nm…). In the highest-performance situations, the features are so small that visible light can no longer resolve them, and inspection systems must use deep ultraviolet (DUV) wavelengths for illumination. Uniforce Sales and Engineering is an Engineering company specializing in image acquisition, image processing and video recording hardware and software, components and systems. 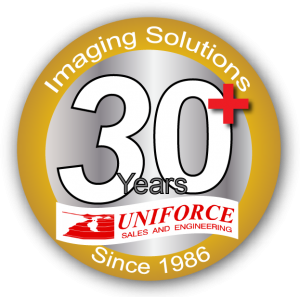 For over 27 years, Uniforce has provided cost effective, highly reliable imaging systems and solutions to semiconductor, military, medical, aerospace and broadcasting industries amongst others. We sell cutting edge image acquisition and image processing solutions to OEMs, distributers, VARs, contract manufacturers and End Users. Our experts have the technical knowledge and experience to assist you. The continued success of Uniforce Sales and Engineering is based on long and well-established relationships that we have earned from customers, suppliers, business associates, employees, and we have the ability to engage new customers to forge new relationships. We have a customer first philosophy, whether it is a small business or a global enterprise, the same high level of commitment and service applies. We look forward to serving you. Uniforce Sales and Engineering’s mission is to provide a well-integrated, cost-effective, and state-of-the-art imaging capture solution for each customer. Our key strength is our extensive expertise and knowledge of image-capture, storage and processing, to provide timely solutions and support. We take pride in our constant effort to stay at the leading edge of technologies with which we provide excellent support to customers and partners via phone/email or on-site.